Looking for a healthy vegetarian meal? Look no further than these tasty tacos! Pre-cook sweet potato in the microwave for 3 minutes, then cut sweet potato into ½ in cubes. Toss cubes in 1 tablespoon olive oil and bake at 375°F for 25-30 minutes, or until tender and golden. While the potatoes are cooking heat the beans over low heat, adding a pinch of cumin or coriander midway through. Dice onion and sauté in olive oil until tender. (If you are feeling adventurous and have a dark beer around, cooking the onions in beer instead of olive oil yields a nice flavor). Rip washed kale into bite size pieces and sauté in a pan over medium heat with 1 tablespoon olive oil. 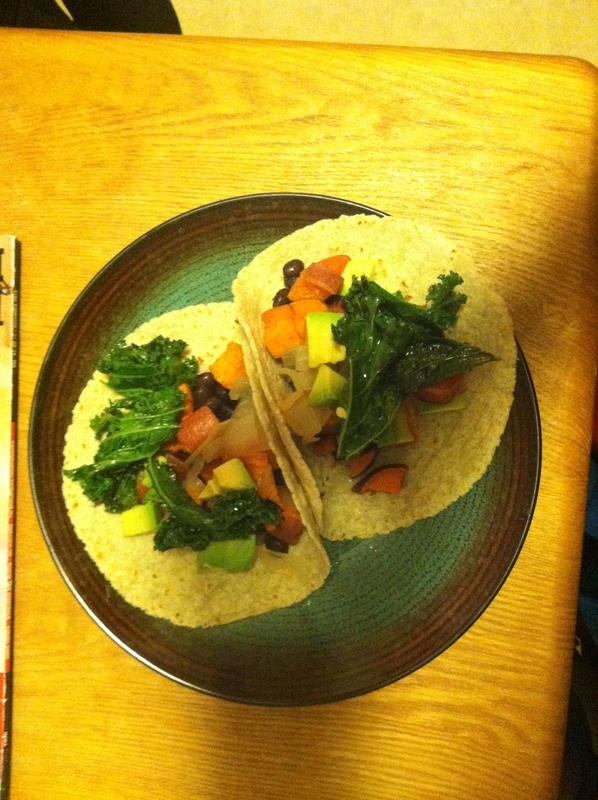 Divide sweet potato, beans, onion, kale, and avocado evenly amongst 8 tacos. This entry was posted in Recipes and tagged sweet potato recipe, tacos, vegetarian recipe. Bookmark the permalink. ← Should You Eat: Chocolate?